Developer Quote: "Get ready for Easter and the spring season with Holiday'd!" We don't all celebrate Easter, but for those of us who do, it's a special reason to prepare colorful greetings and photos to share with family and friends. With Holiday'd Easter Photo Fun!, you can create a bright and happy holiday photo with a few taps and a lot of imagination! These cards are suitable for all ages, just pick an age appropriate background to suit. • Use the clear background to just add fun Items and Text to a picture. If you choose that same picture from the library, you can add an accessory to everyone's head in the photo! Or choose any picture you've Holiday'd before and add additional accessories and text! • Share with your friends via MMS, Facebook, Twitter, and email! Open the app and you will see simple instructions on how to use Holiday'd Easter Photo Fun!. There ae tabs at the bottom of the display for you to start with choosing a Photo, Theme, Item and then finally to Share. Photos, once chosen, are easy to manipulate to get the head shot the way you want. Adding a theme is hard only because there are so many beautiful ones from which to select! The colors are both vivid and muted, while the images are both cartoon and real. As if the themes are not enough, you can add in Items also which really round out the picture. Send off your creation as as extra special greeting to those near and dear, and why not print out a copy for yourself! 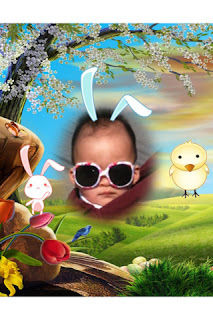 COOL CONCLUSION: "Holiday'd Easter Photo Fun! is a gorgeous way to send off Easter greetings, or themed photos without costing a penny!"